Limpopo based side, Baroka FC competing in the National First Division (NFD), have signed Castle Academy graduate, Thabang Mothogwane. Mothogwane who hails from Mamelodi Gardens in Tshwane was identified in the nationwide scouting that took place in 2014. He was among the 45 players who were selected to join the Castle Academy camp trials last month. After making the 23 man squad known as the Castle Academy SuperStars, the former Sampadoria defender who hopes to emulate Kaizer Chiefs player, Tsepo Masilela put on a solid defense at the right back position in the matches the SuperStars played against NFD and PSL teams. The last of four siblings, Lelo, as he is nicknamed, was ecstatic and full of praise for the Castle Lager Academy for affording him the opportunity and giving him the exposure. “If it was not for the Castle Academy I don’t think I would be where I am today. It’s an honor for me because I have always dreamt of playing professional football, and being sighed by an NFD side is a step closer to the highest level in the country. All I have to do now is keep working hard, stay humble and the rest will happen in time” he said. Mothogwane is hoping for his debut when Baroka FC take on Durban based side, Thanda Royal Zulu in a league match this evening at the Umhlathuze Sports Complex. Baroka FC coach, Sello Chokoe wasted no time as he included the right back player in his 18 man squad that travelled to Durban. “If I get given a chance today, I will not waste it. I am nervous because I have only been with the team for a few days, but I have to put that aside and focus on the game,” Mothogwane concluded. Upon learning of the player’s signing, SAB Sponsorship Manager, Errol Madlala said “It’s always great to hear such news, this shows the impact the campaign is having. Our main objective has always been to take players from amateur leagues, give them the guidance and an opportunity to showcase their talents to the professional league coaches and scouts. We wish Thabang all the best at his new club and hope to one day see him in the national team”. 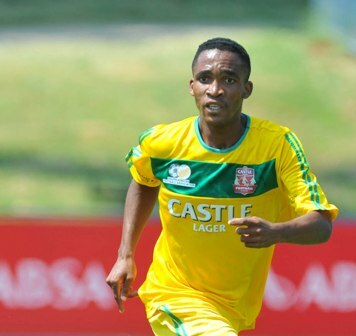 Mothogwana is the fifth Castle Academy graduate to be snatched by a professional side in the three season that the campaign has been running. Simphiwe Mtshali, Deolin Mekoa, Rafiq de Goede and Chase Parsons from the previous two seasons were respectively signed by Kaizer Chiefs, Maritzburg United, Vasco da Gama and SuperSport United. The 2015 campaign came to an end on the 2nd of this month. The 23 players got a chance to play against NFD side, Highlands Park, PSL teams, Bidvestwits, AmaTuks, Mamelodi Sundowns and AmaZulu in the two weeks they spent with Bafana Bafana legends, Phil Masinga, Neil Tovey and Calvin Peterson as their coaches. 3 Responses to "Baroka FC sign 2015 Castle Academy graduate"
Greetings I’m Muzi looking for a great team like boroka to introduce me to world of football. Plz for interest connect on 0744916534.